There are many factors that influence final specification of a transformer. However, the following ten factors MUST be considered when specifying transformers. Table 1 gives the preferred kVA ratings of both single-phase and three-phase transformers according to IEEE C57.12.00-2010, IEEE Standard General Requirements for Liquid-Immersed Distribution, Power, and Regulating Transformers (ANSI). All the preferred kVA ratings in Table 1 are obviously not available as standard at all voltage ratings and ratios. In general, the smaller sizes apply to lower voltages and the larger sizes to higher voltages. In most small size commercial projects, the 208Y/120V secondary voltage is used because the majority of load is lighting and small appliances. A secondary voltage of 480Y/277 V, in addition to the 208Y/120 V circuits, may be required when loads are electric motors or have large lighting requirements. Generally, a three-phase transformer secondary voltage should be selected at 480Y/277 V. This has become standard and is compatible with three-phase motors, which are now rated 460 V standard. Under normal circumstances, a 460 V rating for the transformer secondary should not be selected unless the load is predominantly older motors rated 440 V and located close to the transformer. Phase-to-neutral 277 V circuits can serve fluorescent and high-intensity discharge (HID) lighting. For example, a standard transformer rated 13 200 V to 480 V may have four 2.5% taps in the 13 200 V winding (two above and two below 13 200 V). If this transformer is connected to a system whose maximum voltage is 13 530 V, then the 13 530 V to 480 V tap could be used to provide a maximum of 480 V at no-load. Taps can be changed when the transformer is energized and loaded. These taps are used to compensate for excessive variations in the supply voltage. They are infrequently associated with commercial building transformers except as part of outdoor substations over 5000 kVA. Load tap changers can be controlled automatically or manually. Taps can be changed only when the transformer is de-energized. Tap leads are brought to an externally operated tap changer with a handle capable of being locked in any tap position. This is a standard accessory on most liquid filled and sealed-type transformers. On very small liquid filled transformers and most ventilated-dry-type transformers, the taps are changed by moving internal links that are made accessible by a removable panel on the enclosure. Manually adjustable (handle- or link-operable) taps are suitable for correcting long-term voltage conditions. They are not suitable for correcting short-term (hourly, daily, or weekly) voltage variations. Request improvement of the utility power supply regulation. Segregate the circuits so that heavy variable loads are separated from more sensitive loads. When a source transformer constitutes a significant part of the impedance to a sensitive load, use a separate transformer (or secondary-unit substation) for such loads. Use voltage regulating supplies for just the sensitive loads. Non-standard impedances may be specified at a nominally higher cost: Higher impedances to reduce available fault currents or lower impedances to reduce voltage drop under heavy-current, low-power factor surge conditions. When specifying transformers, best would be to consult manufacturers’ bulletins for impedances of small transformers because they can vary considerably. Transformers are manufactured with various insulation material systems (as shown in Table 2). Performance data with reference to conductor loss and impedances should be referenced to a temperature of 40°C over the rated average conductor temperature rise as measured by resistance. While Table 3 represents the limiting standard requirements, transformers with lower conductor losses and corresponding lower temperature rises are available, when longer life expectancy and reduced operating costs are desired. A Class 105 insulation system allows for a 55°C rise with a total ultimate temperature of 105°C. A Class 120 insulation system allows a 65°C rise with a total permissible ultimate temperature of 120°C. An 80°C rise is allowed for a Class 150, a 115°C rise is allowed for a Class 185, and a 150°C rise is allowed for a Class 220. Materials or combinations of materials that may be included in each insulation material class are specified in IEEE C57.12.00-2010 (ANSI). * Maximum at continuous rated load. 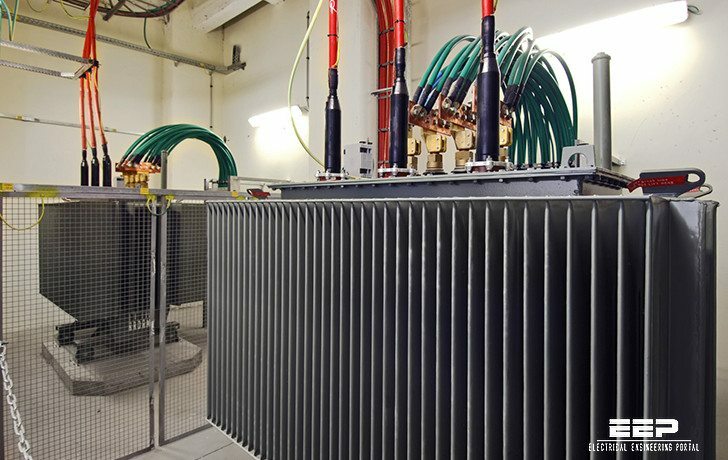 † Dry-type transformers using a 220°C insulation system can be designed for lower temperature rises (115°C or 80°C) to conserve energy, increase life expectancy, and provide some continuous overload capability. Voltage insulation classes and BILs are listed in Table 4. Technical specifications can require transformer sound levels to be below those specified in these two tables. The effects of transformer sound levels can be minimized by placing the transformers in separate rooms, avoiding direct attachment of transformers to structural members, use of sound isolating pads or vibration dampers for mounting, and avoiding the mounting of transformers near plenums or stairwells where the sound will be directed into work areas. For large units, providing flexible connections from the transformer to long busway runs will reduce the transmission of vibrations. Columns 1 and 2 — Class AA rating, column 3 — Class FA and AFA rating. Transformer failures are rare. However, in high-rise buildings and in other buildings where the conditions for evacuation are limited, the effects of the failure of larger transformers can be serious. Air from transformer vaults should be exhausted directly outdoors. Dry-type transformers will usually be preferred to liquid filled transformers (even the less-flammable, liquid insulated types) where fire and smoke considerations are critical. Well-designed transformer protection can minimize the extent of damage to any type of transformer. Dry-type transformers, including the cast-coil-type, if subjected to faults for an extended period, can burn and generate smoke. Liquid filled transformers can burst, burn, and generate smoke. Provisions can be made for dealing with these rare but still possible failure modes for large transformers in critical areas. 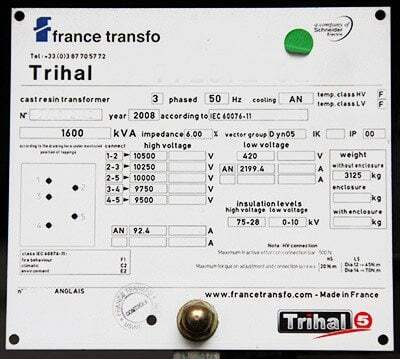 There are over 130 parameters to completely specify a transformer. Some are very critical. some are not. This gives a good idea. But I would also add Ambient conditions and Altitude at the location where this transformer will operate. May we get a pdf file for this topic . Witch Harmonics are produced from Power transformer when it its Not loaded? , then witch Harmonics are produced after loading ?, then how can be solved ? is it necessary to mention the rates of Harmonics during purchasing power transformer. How should I get the Hard copies of all articl which your forwarding on ELECTRICAL portal continues every week ? I am intreseted in keeping / stacking in Library. Impedance Temperature Ratings and Voltage Ratings are some of the important things we need to consider in the specification of a transformer as they are the basic entities that determines the type of transformer for our needs and requirements. To specify a power transformer it is also necessary to define type (oil immersed – with or without conservator – or dry type), type of installation (indoors; outdoors; pole mounted; pad mounted; etc. ), standards that shall be accomplished, primary and secondary voltages, vector group, cooling method and built-on protections (gas, temperature and pressure of oil or windings temperature). In Europe, according to IEC standards preferred rated power for MV/LV transformers are: 25, 50, 100, 125, 160, 200, 250. 315, 400, 500, 630, 800, 1000, 1250, 1600, 2000 and 2500 kVA.